#WoW! It is the day of the 2016 Eurovision Song Contest final, and one can definitely feel a sense of excitement in Malta, as the small Mediterranean country is through to the final after a 1-year absence. Represented by female singer/songwriter Ira Losco with “Walk on Water”, a song she co-wrote alongside Tobias Lundgren, Tim Larsson, Molly Pettersson Hammar and Lisa Desmond, Malta will perform in slot #22 in a strong 26 participant family which will open with Belgium and close with Armenia, as had been previously published. Once more Ira Losco put on a spectacular performance during both dress rehearsals prior to this evenings’ show noting that the professional juries in all of this year’s competing countries passed their judgement last night. It is now up to the viewers who will assess the performances based on what comes on this evening. On behalf of the editorial team at escflashmalta.com, we would like to wish Ira Losco all the very best of luck for this evening, pointing out that whatever the result, the hard work and commitment has definitely shined through. In the meantime, we encourage you all to follow the minute-by-minute #live commentary on escflashmalta.com through Facebook and Twitter which will feature female singer/songwriter Julie Pomorski, winner of L-Għanja tal-Poplu 2005 as well as Frankln Calleja, the 2nd runner-up at the Malta Eurovision Song Contest 2016. On Friday 6th May, each of the participants competing in the 1st semi-final took to the stage once more for a second run through of rehearsals. Ira Losco coming on last in the running oozed charm and confidence, giving an excellent rendition of “Walk on Water”, the pulsing drum and bass song she co-wrote with Tobias Lundgren, Tim Larsson, Lisa Desmond and Molly Pettersson Hammar. A number of changes have been implemented for the second rehearsal, the first being a change in attire, opting out of the large coat of projections, and instead choosing a much more suitable formal ensemble, with a sparkly top and a dark skirt. Ira is much more visibly comfortable on stage, which she shares with Skorpion, who clad in a grey outfit, is dancing sporadically. Once more, the lead vocals were spot-on and the off-screen team of backing vocalists made up of: Pamela, Anna, Molly and Lars created a sound which brings everything together. Some other minor changes which were implemented in the visuals of the performance are the blue swirls which have now become proper water, and also the addition of smoke. #WoW! This was an excellent rehearsal, an everything seems to be falling in place for Malta. We urge you to stay tuned to escflashmalta.com through Facebook and Twitter for all the latest news about Malta’s participation in the Eurovision Song Contest 2016. In her first run through of rehearsals, Ira Losco ripped the Globen Arena to shreds, giving a self-assured account of herself on all fronts, ascertaining that “Walk on Water” lives up to the expectation of saving the best for last. Co-written by Tobias Lundgren, Tim Larsson, Lisa Desmond, Molly Pettersson Hammar and Ira Losco, this is a song which a pulsing drum and bass sound which requires nothing more other than that special touch. Clad in a rather long dress merging brown and gold as base colours, it depicts images on it, confirmed what the female singer/songwriter had stated earlier on in the day, that technology will be one of the special elements on stage during the performance. It seems that we also got a glimpse of the outfit, noting that Ira Losco walked out onto the stage wearing an extremely large dress, which depicts 3D technology, and which she removed with the help of Skorpion, the male dancer mid-way through the song. The lead vocals were spot-on and the off-screen team of backing vocalists made up of: Pamela, Anna, Molly and Lars made the song all the more pleasant, making sure that everything comes together. Other elements of the stage performance for Malta, include the female singer/songwriter walking down the catwalk, something which many will remember having done back in 2002, and also having several overhead shots which show off the stage theme for Malta, that encompassing water. This was a stunning first rehearsal, leading to shortening odds for Malta, now 5th and just behind Russia, France, Sweden and Australia. We urge you to stay tuned to escflashmalta.com through Facebook and Twitter for all the latest news about Malta's participation in the Eurovision Song Contest 2016. Earlier today, the Public Broadcasting Services (PBS) revealed that following discussions with three major international record labels, Warner Music Sweden has been chosen to release “Walk on Water” on all major digital platforms such as iTunes, Deezer, Spotify and Amazon. “We are thrilled to be releasing Ira’s song worldwide’, said Robert Skowronski, A&R and Product Manager at Warner Music Sweden, adding that “Ira is an exceptional singer, and we think this is a very strong song not only for Eurovision but also for commercial release. We look forward to working with her over the next months and of course to her visiting Stockholm for Eurovision itself”. Malta’s entry for this year’s Eurovision Song Contest, co-written by Lisa Desmond, Tim Larsson, Tobias Lundgren, Molly Pettersson-Hammar and Ira Losco, the latter also being the lead vocalist as chosen by a professional panel of judges, and also the public, will be competing in the second half of the 1st semi-final on the 10th May. Ira Losco is currently on a 3-country promotional tour which will take her through Latvia & Russia for massive pre-party gatherings which also feature a number of participants from the Eurovision Song Contest 2016 as well as Armenia, where she will be appearing on a number of talk-shows, and also doing a press conference or two. We urge you to stay tuned to escflashmalta.com even through Facebook and Twitter for all the latest news. Through the 8 o'clock news bulletin, the Public Broadcasting Services gave the first airplay to "Walk On Water", an original song co-written by Lisa Desmond, Tim Larsson, Tobias Lundgren, Molly Pettersson-Hammar and Ira Losco, the latter of which was chosen as the representative through the Malta Eurovision Song Contest which took place at the Mediterranean Conference Centre back in January. Reception thus far has been extremely positive, with the bookmakers instilling a positive outlook on Malta's chances for success at the Eurovision Song Contest 2016. From an objective point of view, "Walk On Water" is a modern pop song, with hints of dance and soul, not too different from the genres scaling the charts all over the world at the moment, noting the relevant success of acts such as Sigma and Emeli Sande. The highlight of the song, apart from the rousing beat, is the last minute which features soaring vocals. The music video, features the female singer/songwriter in various outfits, accompanied by a male dancer most of the time in several locations in Malta and Gozo. It is very well produced, and adds an aura of professionalism towards the effort that the people behind Malta's participation in the international competition is putting. We urge you to support Malta, and stay tuned to escflashmalta.com even through Facebook and Twitter for all the latest news. At the end of January, Ira Losco was chosen by the professional jury, and the public-at-large as the winner of the Malta Eurovision Song Contest 2016 with "Chameleon", an original song she co-wrote with Howard Keith, Peter Borg and Matthew James Borg, collectively known as Talkback. Just a couple of days later, it emerged that the Public Broadcasting Services, in discussion with both Ira Losco and Howard Keith, that revisiting the song was an option, and indeed it was revealed that "Chameleon" entered in a tight race with another nine (9) original songs, which would be judged by numerous local and foreign experts. Just days ago, a new cover photo on the Eurovision Song Malta page on social media website Facebook was uploading with the symbol and three letters, #WOW. It might be an acronym but the blood is boiling and tensions are rising as expectations soar. Ira Losco and her team are currently filming the music video, getting ready to submit the final package during the Heads of Delegation Meeting this Monday and Tuesday. She is expected to also appear on Xarabank on Friday 18th March, a day following the release date slated for Thursday 17th March 2016. We urge you to stay tuned to escflashmalta.com even through Facebook and Twitter for all the latest news. 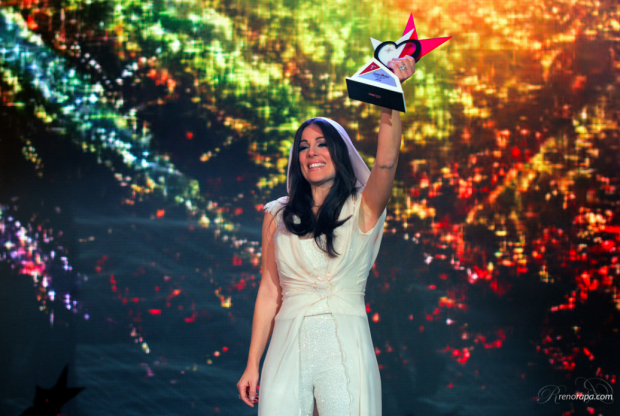 Ira Losco, and the original song “Chameleon” which she co-wrote with Howard Keith, Peter Borg and Matthew James Borg, collectively known as Talkback, was crowned the winner of the Malta Eurovision Song Contest 2016, receiving the maximum 12 points from three (3) of the five (5) professional judges, and the tele-voting. Brooke, and “Golden”, the original song which she co-wrote with Aidan O’Connor, Sara Biglert, and Christian Schneider finished in 2nd place, ahead of Franklin with “Little Love”, composed by Cyprian Cassar with lyrics by Matt ‘Muxu’ Mercieca which finished in 3rd place. On behalf of the editorial team at escflashmalta.com, we would like to congratulate the Public Broadcasting Services (PBS) for putting on an impressive production in light of the Malta Eurovision Song Contest 2016, whilst thanking them for their ongoing hospitality towards the local and foreign members of the press. We urge you to stay tuned to escflashmalta.com even on Facebook and Twitter for all the latest news about Ira Losco and her journey towards the 2016 Eurovision Song Contest in Stockholm, Sweden.